This year has been one of disruptive change for me and the Tutor/Mentor Connection. I turned 65 on Dec. 19 and while many of my peers are retiring soon (or already retired) I'm launching a new business to support the growth of volunteer-based tutor/mentor programs in high poverty areas of mega cities like Chicago. I created the Tutor/Mentor Institute, LLC in July after the Board of Cabrini Connections voted to discontinue support of the Tutor/Mentor Connection in April 2011, after 18 years of operating as a local-global non profit. The change left me with a vast network and a library of resources but without an organizational structure or nonprofit status to recruit talent and dollars that had helped me grow the T/MC since 1993. While my focus has been Chicago, the maps below show that my network and sphere of influence is the world. 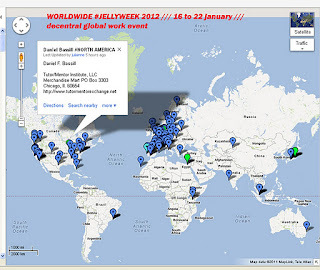 This first map shows participants in the Jan 15-21, 2012 JellyWeek co-working event organized by a group from Germany. I've been contributing ideas to this group and on Jan 19 I will be part of this group's event. I've posted my own vision for a Chicago-based Jelly Week team/project here. I met David Price, Co-founder of Debategraph in September and with his help launched this planning portal. Anyone who is interested or involved in helping kids born in poverty get the support needed to move through school and into jobs ---over a 20-25 year period, can add their ideas to this platform. They can also take these ideas into work spaces such as JellyWeek or the Tutor/Mentor Connection forum on Ning. I was a speaker at the National Drop Out Prevention Conference in October 2011 and will be attending the National Mentoring Summit in January 2012. I use maps to show how these efforts should be connecting and working collectively to assure that all young people in poverty or distressed economic situations can get the support systems they need to grow up and thrive as adults. While I've posted my ideas on this blog and in the sections of the Tutor/Mentor Institute site, I keep looking for more ways to share these ideas and find partners, volunteers, sponsors and benefactors to help me do this work. I began posting essays at Scribd.com in October and already have recorded over 2,000 reads. That number can grow to over 10,000 in 2012 alone. While I build this network of world-wide partners and friends I look forward to continuing to find people who will help grow this network and apply the ideas in Chicago. I keep looking for new ways to attract sponsors so that I can stay in this game. If you value what I'm doing and want to associate your brand with my efforts, why not become a sponsor? Every major city in the world has areas of concentrated poverty and needs a new operating system to engage those who don't live in poverty with those who do. Out of this world of need I hope that I can not only offer ideas that others can use but fund people who will help me develop these ideas in 2012 and 2013, and then take responsibility and ownership of them in future years. Walk alone to create a vision. Work together to achieve it. Below is an article I wrote on Dec. 28, 2007. As I look back this week on articles I wrote during New Year's Week in previous years, this one is really relevant to my current situation. 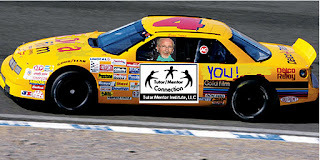 After working within the Cabrini Connections, Tutor/Mentor Connection organizational structure from 1993-2011, with more than 160 volunteers and teens participating each year, I'm entering 2012 as the sole leader of the Tutor/Mentor Institute, LLC. Yet, I'm still carrying on the vision and network-building strategy that has been growing for the past 35 years. It is a lonely role sometimes. Yet there I'm meeting many people along this journey who can help me, and who I think I'm helping in their own work. Hopefully in the next few months I can formalize some of this effort into a new team of people working with me. 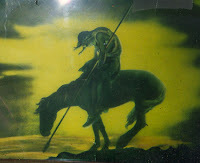 The image of the lonesome warrior is one that reminds me of the men and women who are fighting overseas to make this a better world. As we count our blessings, let's pray for the young people in our armed forces. However, this image is also one that I think of when I think of the people leading social benefit organizations around the world, mostly in isolation, mostly with too few resources to do everything they are trying to do. 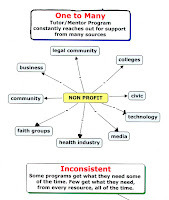 Those who lead small non profits, or are struggling to get social benefit ideas launched, may related to this One-To-Many graphic. We're constantly reaching out in many different directions, trying to find the help we need. We're like fish in a bowl, competing with thousands of others for a limited amount of dollars and volunteers. Unless you've got a powerful marketing machine, or are well connected in donor circles, you succeed some of the time, but not most of the time, and you spend tremendous amounts of emotional capital and energy all of the time. Through the Tutor/Mentor Connection, I'm trying to change this. I'm trying to recruit leaders in many places who lead strategic thinking process in their organization that aligns social benefit with corporate and organizational strategy. Such leaders will use their own advertising, visibility and resources to support the growth of volunteer-based tutor/mentor programs that lead kids to careers, because it's a core business strategy. I've been saying this for a long time, but last week I found an article on the Harvard Business Review that reinforces this concept. The article is titled Strategy & Society: The Link Between Competitive Advantage and Corporate Social Responsibility. Written by Michael E. Porter and Mark R. Kramer. Education and workforce development are of strategic importance for most industries. Thus, if leaders of business, health care, law, journalism, sports and entertainment, etc. 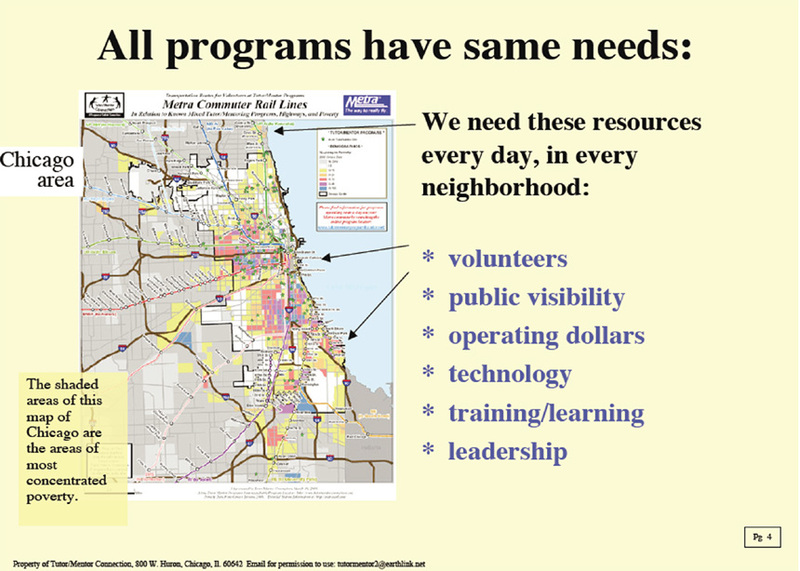 are strategic, they can use tools like the Program Locator and Chicago Program Links to choose what part of a city they want to support, and what programs they want to help grow from good to great. 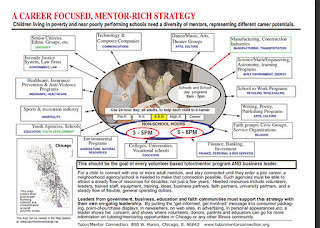 This isn't a strategy to support just one tutor/mentor program, or one brand name like the Boys and Girls Clubs, it's a strategy to help every high poverty neighborhood have comprehensive programs that are one end of the pipeline to jobs and careers for businesses that are strategically engaging their corporate resources to help grow their future workforce. Over the next seven days millions of people will make charitable decisions, either for good will, or for tax deductions. Choose a program like Cabrini Connections, or one of the others listed in the Links Library, and this will show the impact of Many to One. 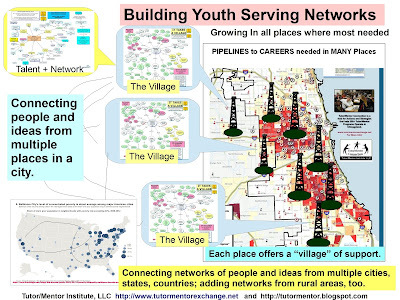 If you've read some of the messages I've posted to this Blog you'll see that between 1975 and June 30, 2011 I led a small non profit that seeks to connect workplace volunteers with children and youth living in neighborhoods of highly concentrated poverty. Our goal is to find ways to draw a growing number of our stakeholders into this learning process and to build an on-going commitment to service (as opposed to random acts of kindness). This process is intended to include students, volunteers, staff, donors and leaders, and members of the business, education, faith and media in the communities where our kids live. It also aims to engage leaders and volunteers from other tutor/mentor programs in Chicago and in other cities, plus people and organizations in the communities that don't have high poverty, but benefit from a world envisioned by Dr. M. L. King, Jr. as well as a 21st Century America where there are enough skilled workers to meet the future workforce needs of American industry. The Internet is our meeting place. It's a virtual library of constantly growing knowledge. 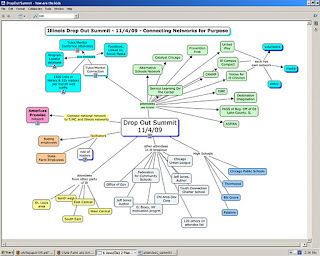 On Tutor/Mentor Institute, LLC and Tutor/Mentor Connection web sites we collect and host information that shows why kids in poverty need extra help, where such help is needed, who is providing help, and what volunteer-based tutoring/mentoring programs can do to connect adults, kids and learning in an on-going, constantly improving process of mentoring kids to careers. If we can find ways to increase the percent of our kids, our volunteers, and our leaders and donors who are drawing from this information on a weekly basis, and reflecting on this information in small and large groups, the way people in churches reflect on passages from the Bible each week, we can grow the amount of understanding we all have about the challenges we face and the opportunities we have. We can innovate new and better ways to succeed in our efforts. This process has already started. We need to nurture and grow it in 2012. Visit the various web sites at the left and start your own learning. I encourage you to read the Power Point Essay titled, Theory of Change which is one of several illustrated essays I've produced to illustrate our goals and the community that we seek to engage. I'm no longer operating under the Cabrini Connections, Tutor/Mentor Connection (T/MC) non profit umbrella, due to strategic changes made in April-June 2011. I've created the Tutor/Mentor Institute, LLC in order to continue to support the growth of the T/MC in Chicago and similar organizations in other cities. I encourage you to read about this change and look for ways you might help me in the coming years. I hope you all are enjoying this holiday season and that we can find ways to connect our efforts in 2012. I read a couple of articles today that support the role of information intermediaries like myself, but support my vision of helping mentor-rich tutor/mentor programs reach more youth in high poverty neighborhoods of Chicago and other cities. A Social Capital Framework for the Study of Institutional Agents & Their Role in the Empowerment of Low-status Students & Youth is a paper written by Ricardo D. Stanton-Salazar, Ph.D., Associate Professor of Education, Rossier School of Education, University of Southern California. The article also introduced the concept of ‘empowerment agents,’ who "not only understand the power of institutional support and social capital in the lives of youth and students from historically-oppressed communities; they carry a vision of a more just, humanistic, and democratic society, deeply committed to an enlightened and fair distribution of societal resources, and to dismantling the structures of class, racial, and gender oppression." Volunteers and staff in mentor-rich programs can take this role if they are trained to do so and if they have the resources to stay in place to support this process for many years. The marketing and information-sharing needed to make this happen has been the focus of my work for the past 20 years. That leads me to the next article, which is much shorter than the first. This is a paper titled Strategic Network Formation with Structural Holes. The paper claims that "people who occupy bridging positions between groups in a network are at higher risk of having good ideas". This is what I do and why I have so many ideas for ways we can make mentor-rich programs more available. However, it's also what could be the goal of "empowerment agents" in hundreds of tutor/mentor programs. If we can teach young people and volunteers to build networks and understand how to use them effectively, they are more valuable in the 21st century marketplace and have more people to help them overcome the barriers of poverty and the challenges of adult lives. 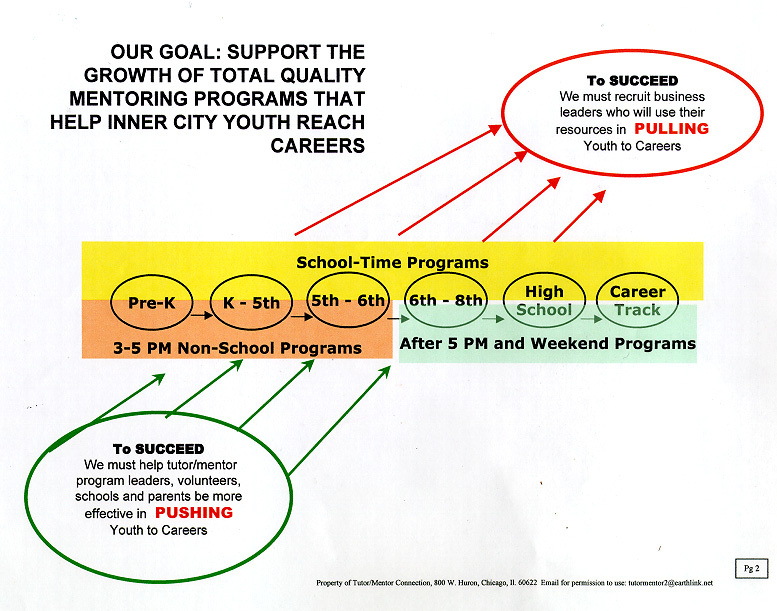 The graphics on this page illustrate the goal of expanding the networks of youth and volunteers who become part of tutor/mentor programs and part of city, state and national networks that connect hundreds of tutor/mentor programs to each other. 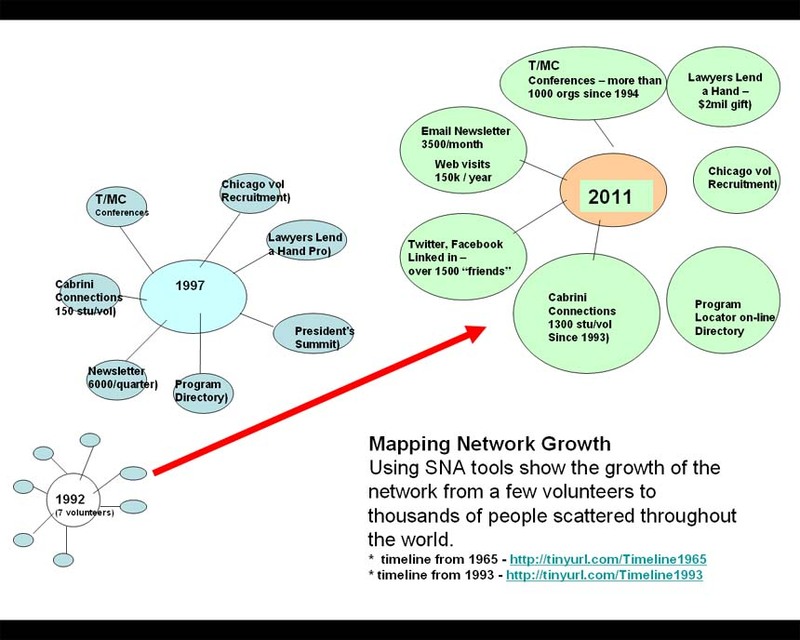 I've created a workspace where interns, volunteers and others can help me develop network analysis tools that could be used to demonstrate the growth of personal networks within programs, and program networks within cities. If you know of others who are doing social capital research or who show the mission of their volunteer-based tutoring and/or mentoring programs from a social capital perspective, please share the information. 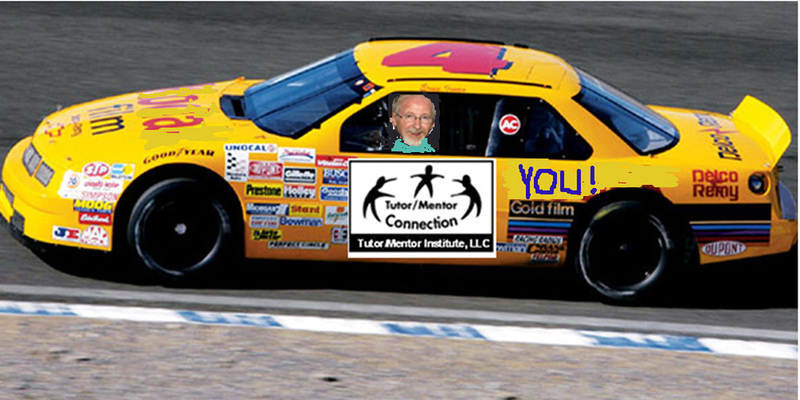 In August I posted an article offering Naming Rights to anyone who would want to provide three to five years of funding for the Tutor/Mentor Institute, LLC or a component, such as the Tutor/Mentor Program Locator. Today I want to offer a different suggestion. 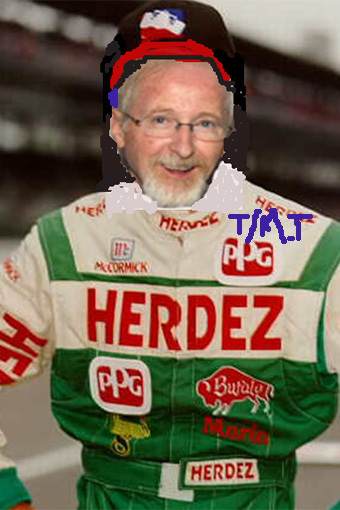 Think of me as a Race Car Driver. Look at all the company logos on this racing uniform. Companies aren't doing this for charity are they? They get some visibility for supporting these drivers. Why not think of people like me who share ideas freely with others throughout the world as Race Car Drivers competing in a race to save Democracy through education. Isn't that something that you'd want to associate your brand with? Maybe I can get some clothing company to create a sport coat that I can wear to conferences or speaking engagements, with the company logo right on the front and with other sponsors on the cuffs, sleeves, back, etc. I can wear this anywhere and even put it in my profile picture on Facebook and Linked in. Maybe one of the major auto companies will donate a car that I can drive to meetings and park in the lots of conferences that I attend, with their logo in big letters along with the logos of other sponsors on the hood, top, back, fender, etc. 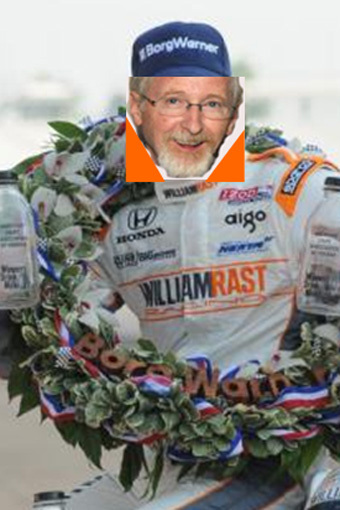 Do you think I could find $200,000 to $500,000 worth of sponsors to keep me in this race each year? Maybe a law firm, or dental office, or book company would want their logo on my jacket. Who else? Can you be the first sponsor, or help me communicate this idea? Maybe others who have ideas to share could get sponsors to support them so they could help all of the people who need their ideas, not just those who can afford to pay. What do you think? Zoom, Zoom, Zoom! It's my 35 years of experience and ideas that are valuable. That's what I have to sale. 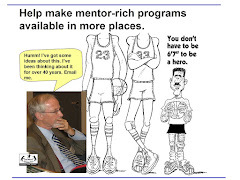 Most of the people starting programs don't have the money to pay enough to keep the Tutor/Mentor Institute growing, or even to keep the web sites updated. 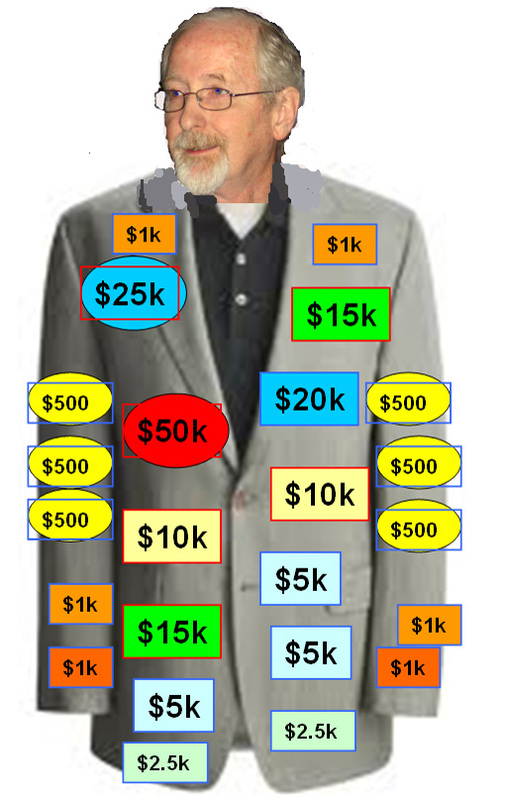 If I can fill this sport coat with annual sponsors, I can raise nearly $200,000 and not only continue to share my ideas freely, but do more of the work to build greater understanding of volunteer tutor/mentor programs and how they differ, and to draw volunteers and donors consistently to all of the different programs operating in Chicago and other cities. 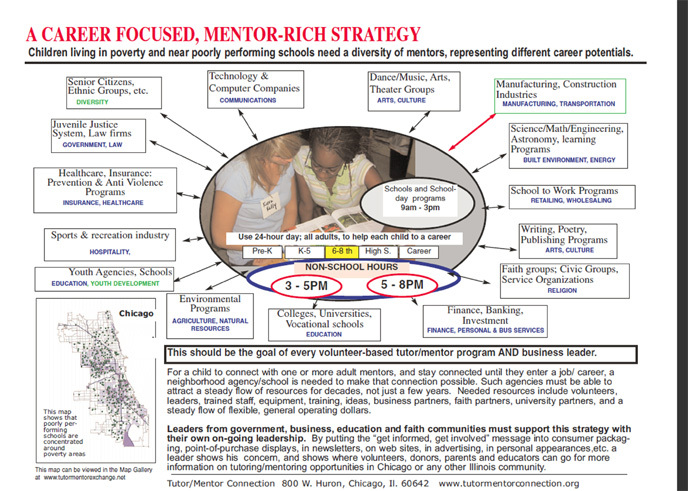 I've been collecting information about Chicago area non-school tutor/mentor programs since 1993 in an effort to make better information available so more people would be doing the marketing and capacity building needed to make constantly improving tutor/mentor programs available in more high poverty neighborhoods. I use this term "constantly improving" instead of "evidence based" or "high quality" because no program starts as a "great program" and hopefully they are are looking at what other people do well and building their own programs based on what they see. If they have the needed resources each program should constantly learn from their own efforts, what other people do, and what research is telling us and applying what they learn, along with what resources they have, to get better from year to year. That's what I mean by "constantly improving" and it can't happen without a consistent flow of resources into programs and without the ability to retain talented people for multiple years. So I've been building this database and trying to keep it updated. I also share the information via a map-based program locator, that also requires constant update. The problem is, I've never had enough manpower on a consistent basis to do this as well as it needs to be done. There are more than 400 listings in my database who need to be contacted every year just to determine if they still offer any form of volunteer-based tutoring/mentoring. That in itself is a huge challenge. There are many more questions I'd like to be asking, but just maintaining the basis core of information has proven to be an almost impossible task. Even if I could be collecting this information in all the ways I want, it would do little good unless I had a massive advertising and public education budget that enabled me to be sharing this with all the people who needed to know it. I don't have such a budget and never will. And furthermore, I don't think any single person or organization should be depended upon to be the master library of tutor/mentor knowledge in a city. I think that information needs to be part of the organizational history of many different groups, not just tutor/mentor programs, but of schools, colleges, churches, mosques, businesses, etc. Helping kids grow up takes 20 to 25 years in the best of circumstances. 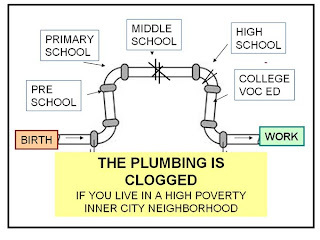 If kids live in neighborhoods of high poverty they face many challenges kids in more affluent areas don't face. The adult support system needs to be broader and it needs to last longer. That means that the knowledge I'm collecting needs to continue to build for decades, not just years. I won't live that long. Small non profits will have trouble lasting that long. Thus, I'm looking for "bricks and mortar" partners who have a long-term investment in a neighborhood. This could be colleges, high schools, faith groups, businesses, etc. It could be a different lead organization in every zip code. Each could have teams of people collecting and updating information about tutor/mentor programs in their area, and sharing this via on-line portals and a master directory like the Tutor/Mentor Program Locator. 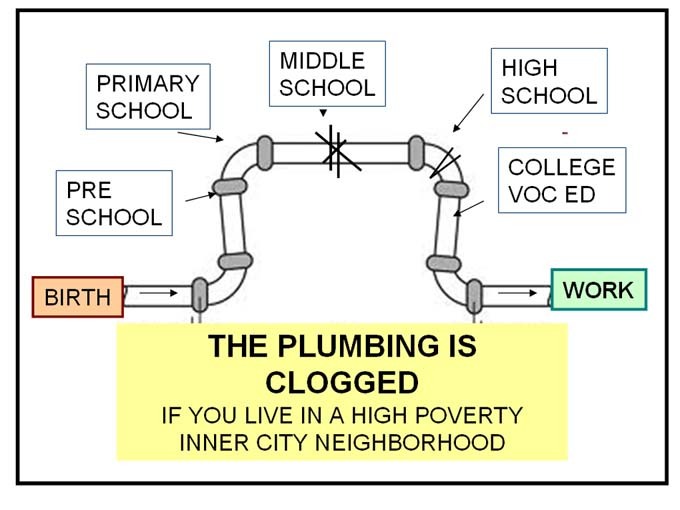 I created this PDF essay to illustrate this problem and the opportunity for students in service learning programs or teams from local business or civic groups to take ownership of this process for a single zip code or community area. I hope you'll take a look and will contact me to volunteer to take on this information hub role for your own community. 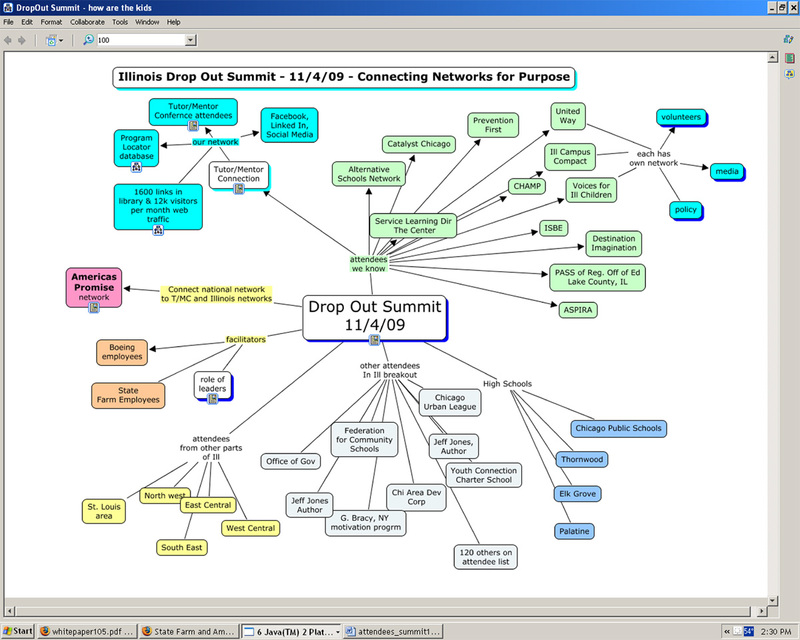 I created the concept map below in October 2011 after attending the National Drop-Out Summit. I updated it today after attending another Drop-Out prevention event in Chicago last week. Until the people organizing these events build some sort of internet portal that connects participants with each other so they can find ways to share ideas, strategies and work collectively toward solving this problem, we'll have too little action following powerful data that should motivate more of us to do more to solve this problem. In the article I wrote Friday, title We All Pay a Price for the Dropout Crisis, I provided quotes from some of the leaders who spoke at events held in Chicago this week. The basic message was “High School Drop Outs Cost All of Us, not just the young people who face a “miserable life”. (This map was created by Learning Point Associates. See this and other maps here. I’ve attended dozens of events focused on poverty, public education and the dropout crisis. 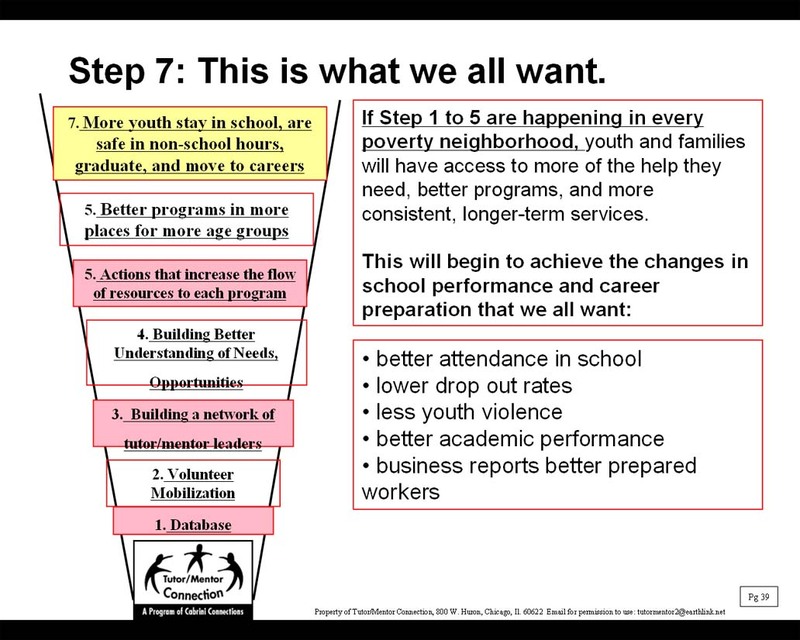 I’ve read all sorts of research on how to make youth programs and schools more effective. They all have a point where they say “if we had the money” and if we had the “public will” to create policies and funding strategies to support better schools and better workforce-development activities. That’s what I focus on. I’d like to suggest two strategies in this article, which I’ve written about often in the past. 1)Using maps for accountability, resource distribution and to obtain the 51% of votes needed to enact new legislation. I suggest that leaders and voters could use maps to build understanding where this problem is most severe, build public support, and to hold elected leaders accountable for what they do. 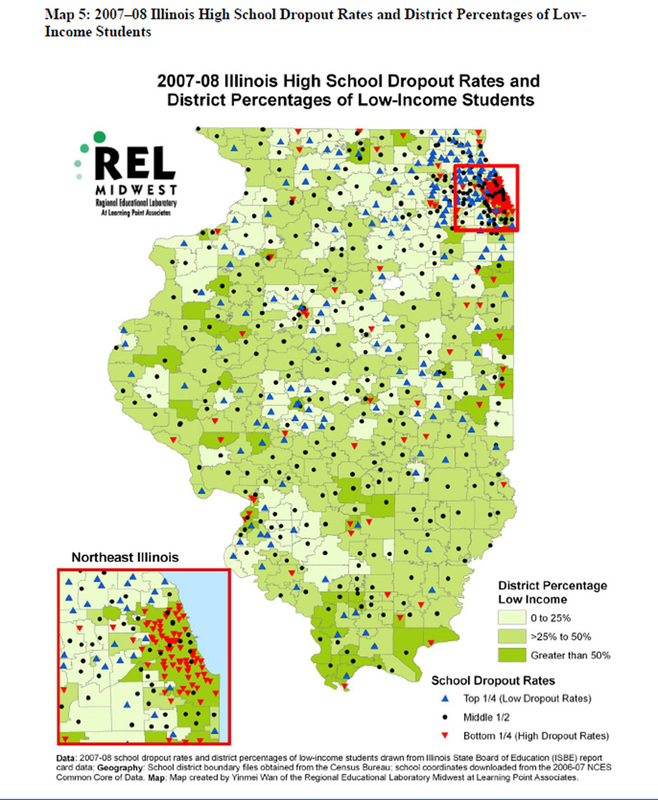 The map above shows locations of high drop-out schools in Illinois. They are mostly concentrated in urban areas but they are scattered throughout the state. 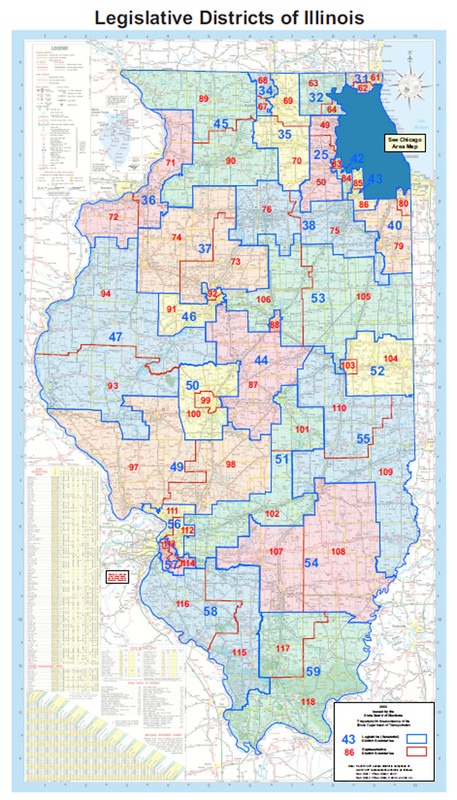 The map below shows state legislative districts. 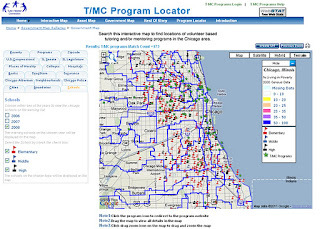 The third map is from the Tutor/Mentor Program Locator and shows legislative districts in the Chicago area, with overlays showing poorly performing schools, poverty, and locations of existing non-school tutor/mentor programs. Using maps like this, leaders could determine what districts have high drop out schools. These are districts where elected leaders (and businesses) should be held accountable for what they do to bring resources to the district to combat this problem. 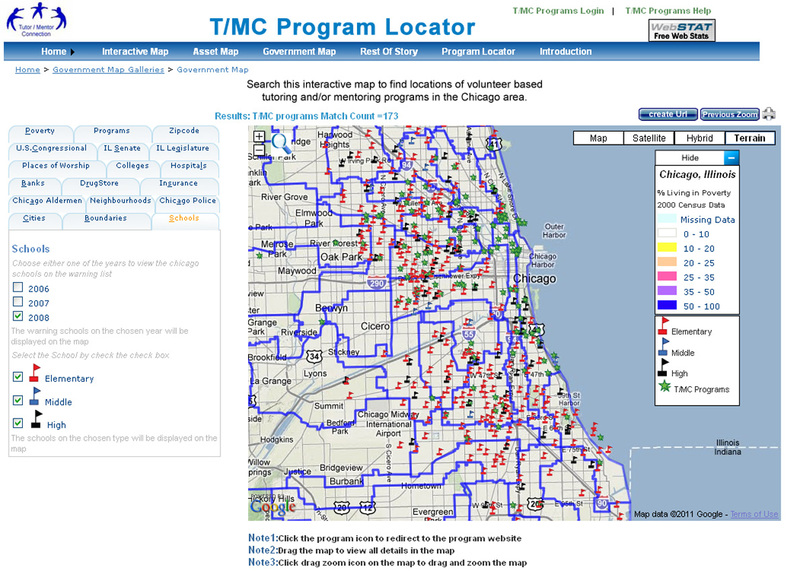 The Tutor/Mentor Program Locator map does not show all schools, or have a layer of data showing dropout schools. We could build this if we had the resources. However, such a map may be already available from another sources. If it is, let me know and we can point you to it. If such a map does not yet exist, then it could be created through a service learning or graduate school project at a local high school or university. I outlined this map-building process in this PDF essay. Once the map is available on the Internet we can determine how many votes are available from representatives with drop out schools in their districts. If it’s not 51% or more of needed votes, then the next step would be to look at surrounding districts where people and businesses are paying part of the costs of youth not finishing school. We could also look at districts with schools where a large number of youth are not finishing school, but which are not as bad as those in the “high” drop out category. The goal is to identify enough representatives in the house and senate to get 51 to 60% of the votes needed to pass new legislation. 2) Expand the number of people who “care” enough to vote, volunteer and donate. This is equally important. At Wednesday’s dropout event, Andrea Zopp, President of the Chicago Urban League said “We’re tired. We don’t vote”. We need to get more people into the voting booth. However, just getting more people in districts with high dropout schools to vote won’t assure 51% of the votes needed to change legislation, unless there are that many legislators representing districts with high drop out schools. We need to find a way to build empathy and support in more affluent areas where they don’t have a lot of poorly performing schools. We can do that through an effort to increase the number of volunteers who connect with inner city youth in volunteer-based tutor/mentor programs. This article was converted into this animation by an intern from the University of Michigan working with one of our one-year fellows from Northwestern University. Then it was converted into a video with the help of a volunteer from the United Kingdom. The point of this article is that volunteers from many parts of the city and suburbs are connecting with inner city youth in non-school and school based tutor/mentor programs. If those volunteers are well supported and stay involved for multiple years some will build a personal bond with the kids, and an empathy for the problem, and will be willing to do more to help the kids move through school and into careers….if they are well-supported in their programs and encouraged in an on-going public education effort. If we were to have 100 mentor-rich programs in the Chicago region with 50-100 volunteers each, that could be 5000 to 10,000 volunteers who actively advocate for public and private sector policies that help them in their own efforts to help kids to careers, and help schools and others do more of the work that needs to be done. If in the other big cities throughout the state there were another 100 programs with 25-100 volunteers involved, that could double the number of potential advocates working to change the number of votes available to support new policies that reduce the dropout rate and help more kids through school and into careers out of poverty and contributing to the tax base and the democracy we cherish. If we keep volunteers connected to kids and programs in years after they do direct service, the total number of potential voters would be even larger after 10 or 20 years. If we also are showing young people what it takes to help them move from poverty to jobs and careers, young people who graduate from these programs can also become voters and advocates. This represents an army of not-yet-organized potential! Take time to review these ideas. Share them with people in your own network. Support the infrastructure that leads to a growing number of volunteers connecting with kids in neighborhoods with high-dropout schools. Build map-based accountability and resource distribution strategies that assure that a full range of birth-to-work programs reach kids in neighborhoods with the highest dropout schools. Instead of paying $200,000 a year to keep a youth in juvenile detention or paying $50,000 to keep an adult in jail, redirect this money to an education and enrichment system that moves more of these young people to jobs and careers. Rev. Corey Brooks, pastor of New Beginnings Church in the Woodlawn neighborhood of Chicago has been camped out on top of a vacant hotel to draw attention to the violence in the Woodlawn neighborhood and raise money to build a new youth center. 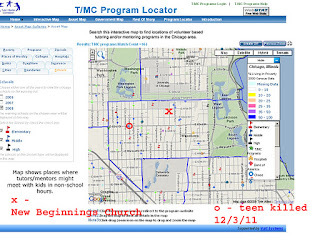 The map above shows where the church is located and also shows where a 16-year old teen was shot and killed last Saturday. I've written about Woodlawn in the past and have offered the ideas of the Tutor/Mentor Connection and Tutor/Mentor Institute, LLC to help build a year-round strategy that draws attention, volunteers and dollars to youth programs throughout the Woodlawn neighborhood. I offer that service again today. I encourage you to read some of the essays I've posted on Scribd.com and use these in discussion groups this week at churches, congregations and mosques throughout the Chicago region. There is no more unifying activity than people from different faiths working together to help young people have the support system they need to grow up safely. 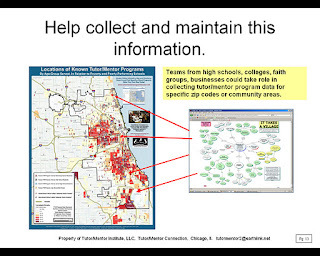 Visit the Chicago Tutor/Mentor Program Locator and learn to create your own maps. This video was created in June 2011 by an intern from Illinois Institute of Technology. It shows what can be done to help non profits by students using their talent and technology skills. Since June the Cabrini Connections and Tutor/Mentor Connection have split into two organizations. Cabrini Connections continues to operate under a non-profit tax status while the Tutor/Mentor Institute, LLC was created to support the continued operation of the Tutor/Mentor Connection. The strategy I've been developing for 18 years is based on retail advertising principles learned while working with the Montgomery Ward corporation. 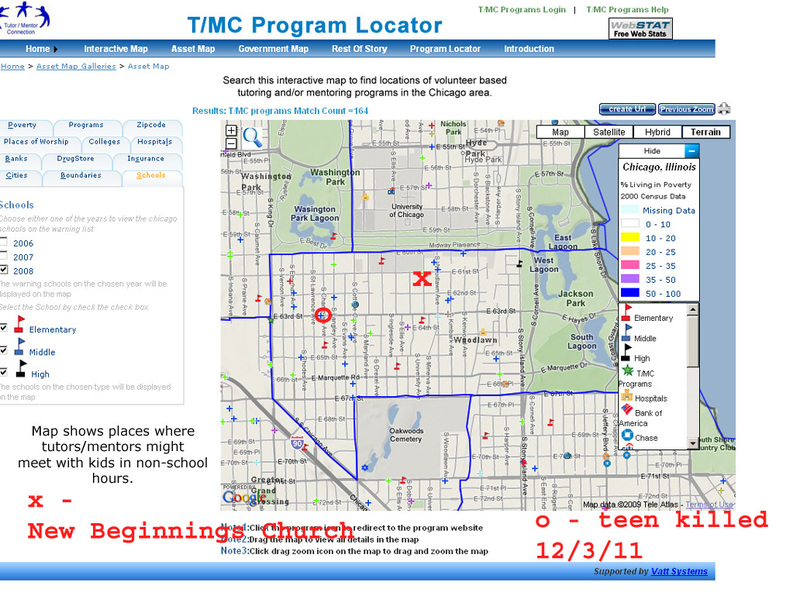 a) we have created a map/ directory showing more than 150 tutor/mentor programs in Chicago, with links to their web sites. b) if we can create more videos like this, and news stories like these, we can attract volunteers and donors to the programs in the directory the same way retail stores attract shoppers each week. To do this we need thousands of students working in groups like our Ning forum so that every day a video, animation, blog article or some similar form of communication is reaching out to evangelize the tutor/mentor message and draw volunteers, donors and youth to web directories where they shop for where and how to get involved. As we build traffic through these efforts we hope to also attract sponsors who will help pay for this work and provide prizes and awards to encourage even greater participation of the talent needed to communicate these ideas. Can you become one of the early-stage sponsors and investors in this idea? Over the past 15 years there has been a growing movement in philanthropy to document outcomes and to support grant requests and program development with "evidence". I found this article on the Stanford Social Innovation Review today titled "Why Peter Drucker Distrusted Facts"
Innovation is Messy - "Innovation isn’t a race. First isn’t always best. Use the tools that are available right now and build on the work of others as necessary to improve incrementally." Innovation Will Always Have Messy Parts: Wisdom from IDEO's David Kelley and 3M's Bill Coyne - "... one element of the process is tougher for many people to accept than the rest -- that it is a messy and uncertain process and efforts to make the early messy stages more rational, safer, and generally neat and clean comforting get in the way of the process." Spaghetti & Social Innovation: What should stick? "the emerging field of social innovation is like being in a kitchen where the recipe for social innovation is still uncertain and perhaps always will be. While there is definitely a case for articulating core ingredients (e.g., novel solutions that tackle social problems in ways that significantly shift the way the social problems are understood and managed), a wonderful part of social innovation is the openness to variety in how that might be approached and organized." These are just a few of the articles that I've looked at on this topic. I'm interested in this because my vision of volunteer-based tutoring/mentoring requires the involvement of volunteers from beyond poverty along with youth and families living in poverty who are constantly looking for better ways to build youth career aspirations and learning habits along with a network of adults who can help youth in high poverty neighborhoods move through school and into careers where they fulfill those aspirations. I don't think anyone has a magic solution yet, or a pill you can give any kid and turn them into a motivated, disciplined learner. Kids in poverty have a lot more external distractions and a lot fewer family and community role models to show them jobs and careers they might aspire to and get them there. Thus, we're in a process of innovation and we need a lot more people involved. I created this "Operating Principles" pdf many years ago to show how we want to engage everyone in a tutor/mentor program in this learning process. In a volunteer-based tutor/mentor program the volunteer is in direct contact with the youth so the volunteer must be involved in this innovation. However, volunteers don't come to this work with 35 years of experience that I now have. So that means the staff who coach this process need to be passionate about learning and innovation and need to lead and coach youth and volunteers to grow into this role. But I don't know of a university teaching this skill and I've never had staff people come to me already "hard wired" with these innovation habits. And due to funding and the work/stress of being employed in a poorly funded non profit, we can't keep young people involved for 10-15 years so they become experienced, visionary older people! How do we innovate solutions to this problem so such leaders are in thousands of locations? That's the innovation and process the Tutor/Mentor Institute, LLC is focusing on. How many of you have read the Jim Collins book titled "Good to Great and the Social Sectors"? If not, you get a copy from your local library or Amazon.com and read it. 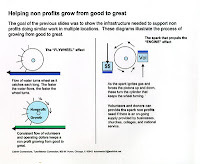 Read this Tactical Philanthropy series of articles and reflect on the resources needed to grow from good to great, and to stay great for many years. I’ve applied Good to Great concepts in the leadership of Cabrini Connections and the Tutor/Mentor Connection (and before that in my leadership of the Montgomery Ward/Cabrini Green Tutoring Program) since 1977 when I learned about Total Quality Management (TQM) while working as an Advertising Manager at Wards. I was lucky to have many mentors during the early years and one said “If you don’t write you plan on paper, you don’t have a plan.” Thus, every year since then I’ve written the plan, and made an effort to share it with others in the organization who needed to be the people who embraced the plan and made it a reality. I now share that plan via our web sites and this wiki with people from around the world. 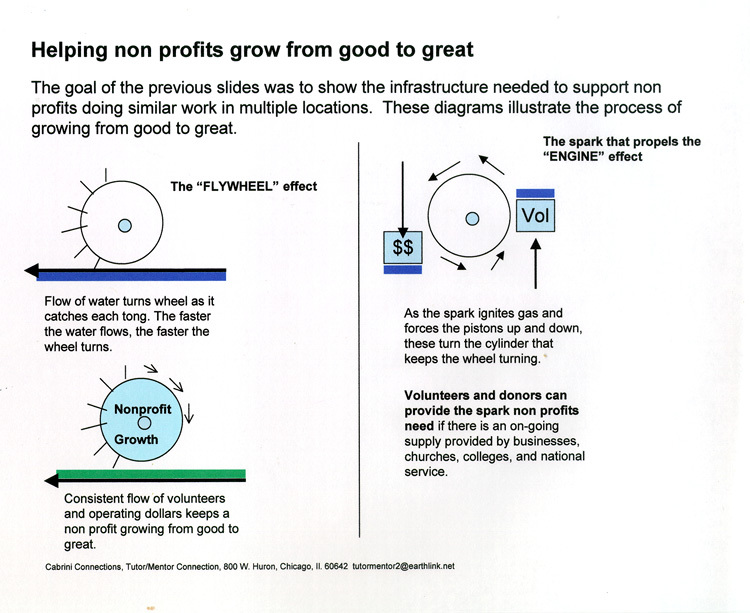 Since Good to Great is a new way to understand process improvement, I am embracing it, and think this can really help us focus the board and all of our other volunteers on the mission of any single tutor/mentor program and the Tutor/Mentor Connection type citywide strategy rather than just the fund raising. Below I’ve listed what I feel our our Hedgehog values. Do you agree with these? Are there others that you might add to the list, or that you feel are more important than these? Do these ignite your passions and make you want to sacrifice as much as our soldiers in Iraq to end poverty through mentoring kids to careers? Maybe that’s an extreme example of commitment, but what would it take you to make a sacrifice that is even 10 or 20% of what’s represented by the “ultimate sacrifice”? 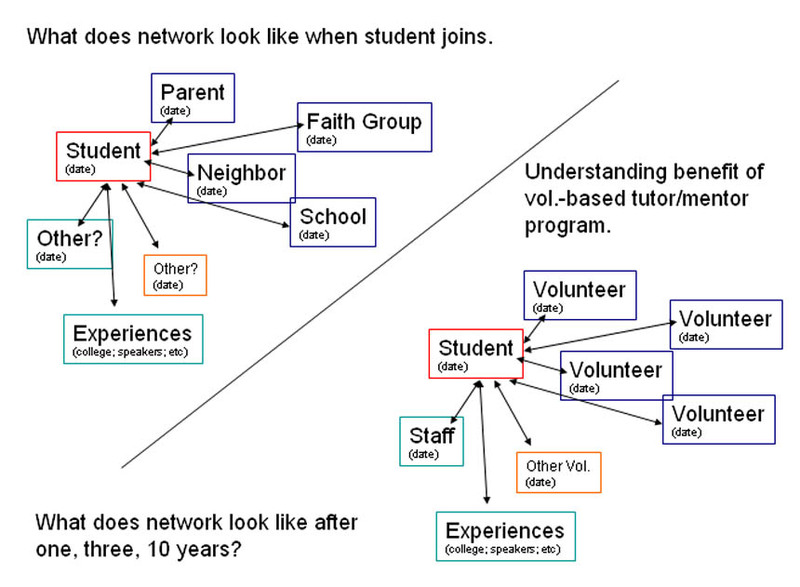 a) Getting a youth and volunteers is only the start of the tutor/mentor process. A program needs to keep youth involved and connected from when they first connect at least through 12th grade. We've tried to do this since 1993 for youth living in the Cabrini Green area of Chicago, giving more than 580 youth the opportunity to participate in a comprehensive, long-term tutor/mentor program (Cabrini Connections), which connects them with a diverse base of adult mentors and learning experiences. From 1975 to 1992 we applied the same concepts in a program serving younger 2nd to 8th grade youth. If we were not providing this, no one else would be. 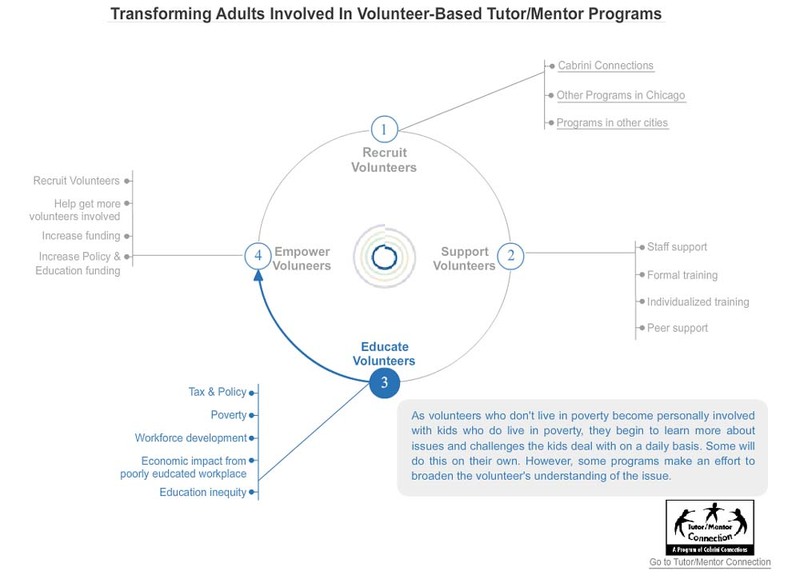 b)We maintain a database of Chicago area non-school tutor/mentor programs and an understanding of where they are located, vs where they are most needed in the Chicago region. 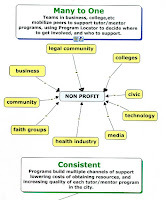 c) We use the database to invite program leaders and stakeholders to gather on a regular basis for networking/learning and capacity-building activities that benefit ALL programs, not just a few highly visible programs. If we were not providing this service, no one else would be. (No one else can without building and maintaining the type of database we own). What we are doing is providing a form of community information, which is described in this white paper by Peter Levine of Tufts University. d) We focus on building strategic involvement and long-term commitment from the business community, which uses company resources (people, dollars, jobs, etc.) to build great programs that PULL kids to careers. Most others focus on what government, teachers, parents need to do. We focus on what business and private sector needs to do because we recognize that there is not enough government money to fuel the operations of programs like Cabrini Connections in all the places they need to be, and for all of the years they need to grow to be good, then to be great. e) We use Internet to connect people and ideas from around the world, and to stimulate the flow of resources directly to t/m programs throughout Chicago. In the volunteer section of the Cabrini Connections web site we hosted a "resources to help you" sub-section. This includes links to the volunteer handbook, homework help, and other materials that we hoped all volunteers will read and use as a constant resource. Another sub section focuses on additional web resources to learn from and incorporate in your tutoring, mentoring and advocacy for Cabrini Connections. This information is what unites us as a community of purpose. As more of our members understand this information we create many owners and many leaders. We can withstand any changes in leadership. We can constantly get better at what we do. One of the articles I point to is a pdf from the UCLA Center on Mental Health in Schools. The title is School Engagement, Disengagement, Learning Supports, & School Climate. This focuses on motivation, which is the fuel that drives student learning and aspirations. I encourage volunteers to read this, think about this, discuss it with others, and try to find ways to help tutor/mentor programs motivate students, volunteers and leaders to do more each year to help us achieve our mission of helping kids to high school graduation, college, then careers. f) We are a learning organization. The information we share on these wikis and our web sites is available to any member or supporter. We need to find time to read, reflect and use this information on an on-going basis. This is a lesson I have tried to teach staff, volunteers and partners of Cabrini Connections since we formed in 1993. It's also the core idea we share through the Tutor/Mentor Institute, LLC see web site which was formed in July 2011 after the Board at Cabrini Connections decided to downsize and no-longer support the T/MC strategy. Leaders, volunteers, students, donors and supporters of programs like Cabrini Connections need to become active network weavers, people who use search engines like Google to find places where other people are offering tutoring/mentoring, or discussing issues related to effective tutoring/mentoring. In these groups members need to participate, sharing information from what they do at their own programs, and providing invitations for people in these groups to use our web sites, or join in the activities that we do. I do this every day, and if you search Google for 'Bassill', or ‘tutor mentor’ you will find numerous places where I am actively networking. Each person in a tutor/mentor program and a tutor/mentor community should set a personal goal to be active in 5-10 places each month, over the course of a year. If 50 people are doing what Dan does, we can dramatically increase the influence of the ideas we all share, and the number of people who are helping us achieve our mission. h) We have innovated a knowledge-based innovation and networking process that can be applied by people in other cities, or in any other social benefit sector. i) We have piloted innovative network-building tools using maps, graphics, video, animation and interactive on-line databases. These can be applied in other cities for the same purpose as we use them in Chicago, or in other social benefit sectors. Few other organizations in the country can claim this many years of continuous learning and application of knowledge to build and sustain a volunteer based tutor/mentor program. However, we have not communicated these ideas effectively to enough people and have not built the leadership team and organizational strength to be able to expand our influence and fully develop and share these ideas. That will be the goal of Tutor/Mentor Institute, LLC over the next five to ten years.